Room 5: Welcome back!! Term 2 here we come!! Welcome back, I hope you enjoyed your holidays and got to spend some quality time together. We have a busy term ahead so keep an eye on our blog, school blog and newsletters for more details. 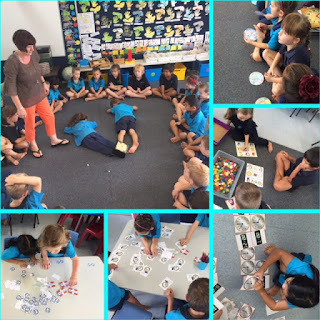 This week we started on our maths unit , with the focus being time. We have talked about what we do during the day and what we do at night. Today we also started learning to tell the time, so feel free to talk about this at home with your children. Today we welcomed our first new student for the term - Ruby Grice. Ruby had a great first day and quickly settled into Room 5s routines.